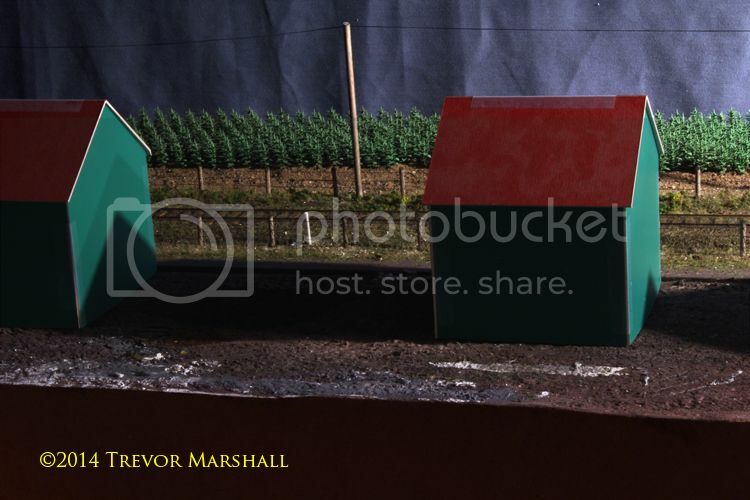 Having recently started my models of the tobacco kilns for St. Williams, I’m now paying more attention to the kiln scene on the layout. And I’m pondering whether five is the right number of kilns to build. I might only need three. It’s not a question of shirking from the task: I enjoy building structures. But I moved the mock-ups around on the layout a bit today and took some photos – this is the advantage of mock-ups, after all – and I’m of two minds. When I measured my prototypes (in Scotland, Ontario a couple of years ago), I also measured their relationship to each other, and they were spaced “two kiln-lengths” apart – like this: K # # K # # K # # K # # K. While more prototypical, this creates a much more relaxed view as the two photos below demonstrate. I won’t do four, since identical objects look better to me when they’re clustered in odd numbers. And I must also be cognizant of the practical purpose of these kilns, which is to serve as a view block and distraction – drawing the eye away from the train as it exits the layout and enters my open yet unlit staging area. This entry was posted in layout design, St Williams tobacco kilns, structures by Trevor. Bookmark the permalink. I’d say go with five. Yes, it impacts line of sight on to the track, but it’s a pet peeve of mine when trains service “industries” smaller than a boxcar! Try putting a train on the main, maybe drive it up and down, and see how it looks. I also like the look of 3 kilns for the more “open” look. Simon’s idea may help the most. Hope you were expecting different opinions ; I’m sure which ever you choose will be right as the rest of your layout is outstanding. From your photos, I like the 3 kiln look and I also like the view between the kilns, however to actually see them on your layout may change my opinion. There is another reason why the kilns are 2 kiln distances apart and that is FIRE. I believe that Kilns on the past have been rather vulnerable because of the heaters and the type of material that is being dried in a wooden structure. Therefore if possible, they were placed far enough apart so that if one went up in flames, the others could still be saved. In the 3 kiln scenario, would a mirror help (a la John Allen)? Three would be the go, five tends to look like terrace housing. Three kilns looks about how I remember my Aunt’s tobacco farm in Brant County; need room for equipment to load and unload the kilns through the doors on the sides. Have you given further thought to modeling one open or perhaps being loaded? 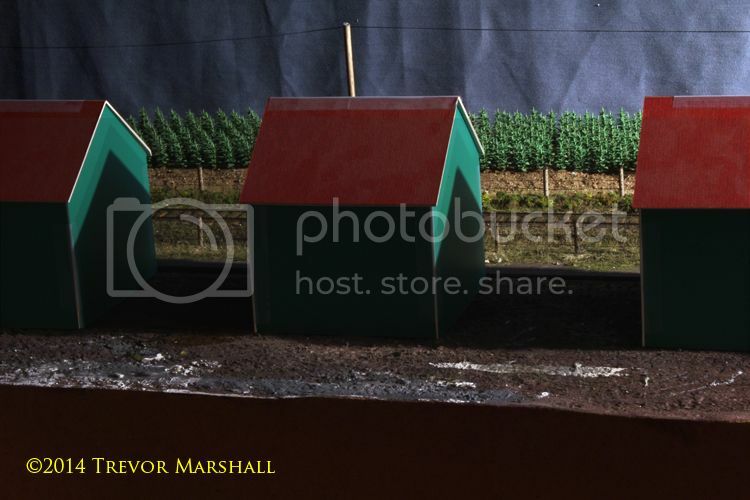 You included some nice photographs in your April 29 post and it would make for a challenging and interesting scene but can’t recall if that fits the season on the layout. I’m not sure if it would work or not, but how about angling the kiln’s so that it is implied that there are others there, but in the aisle unseen? Things are not always perpendicular to the Railway’s ROW. I do, BTW, agree with you about using odd numbers. If this isn’t doable or to your liking, I think I would go with the trio, it just looks better to me. Seeing this scene in previous posts, just looks crowded to me. An excellent suggestion. Lead the viewer to what you want them to “see”. 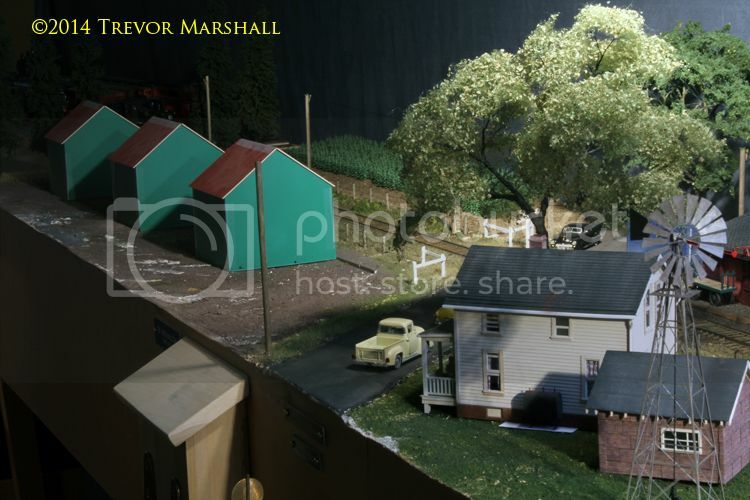 Suggest that you take a look at http://themodelrailwayshow.com/cn1950s/?p=60 for a prototype picture, and then consider using 5 kilns by inserting a bit of extra real estate before the swinging table. Thinking about Brian Termunde’s suggestions a bit more and looking at the photo that you reference, Terry, a second “row” of kilns need not take up a lot of space. I should add–what if the second row of kilns were false-fronts or “slices” of the walls of the kilns? Were the original kilns any where near the tracks? If so are they parrallel to the tracks or did they follow a property line? The K##K##K looks more like what you would expect to see. How many carloads of tobbaco would be shipped per year? I hope you publish the photos with the train in the background, because I suspect that will be the key to your final decision. Mother Nature’s things comes in odd numbers, but Man Made objects usually come in even numbers. Since you already have 5 mock ups, maybe you should try with four klins, and also try to add some “forced perspective” by putting the klins near the fiddle yard closer to each other, and the ones by the road farther apart. Looking at the two photos, somehow the 5 kilns look too cramped. Other parts of the layout give a spaced out feeling, but this area doesn’t. Can you angle them more to give the impression of more kilns even if there aren’t anymore? I like the look of the three kilns better than the five, as has already been mentioned; five looks too crowded to me. It is a well-known trick in (real-world) gardening that you plant things in odd numbers. I use that same trick in my model railroading, such as planting an odd number of trees together in a group. So, I would recommend sticking with the odd number you suggested. I guess I’m against the crowd, and I do mean a lot of comments. I like the five, as three looks too small of and industry. I do like looking through the kilns and into the scene. Someway of suggesting more kilns was a good idea that I also liked.. It will be interesting to see what you will come up with and we will be watching. If the aim is to have the kilns be a view block and the photographs are taken from the normal viewing angle, three kilns looks to be about 90% as effective as five kilns at accomplishing the view block. I see the trains on the sector plate in both photos. However, the scene with three kilns does look MUCH better to my eye. I don’t think having more kilns will necessarily equate to conveying a larger industrial importance. If you fully detail the interiors or have something of interest to draw the eye to the cluster of three, I think you’ll achieve your goal of “hiding” the sector plate. Do that which you will not do: four. It gets away from conventional model railroad compression and the convention of always doing odd numbers. which shows the areas available and the original intent to use the tobacco kilns as a view block. As you can do mock-ups very easily, I would suggest that you try lining up the cardboard kilns along a line that is at an angle to the track (getting closer as you approach the turntable) and then bend round into the aisle. Just another suggestion – but I would suspect that you’ve been doing this today already! Thanks for all the feedback. Much to consider. Is there enough space on the opposite side of the track, beside the corn field, for two of the kilns? That may allow wider spacing but keep the odd number you wish. The staggered arrangement on opposing sides may be of visual interest. First, they have to help tell the story of tobacco farming, which was hugely important to the region (especially in the era I model). As part of this story, I’m considering whether to model the kiln closest to the station with its loading doors open and with a tying crew prepping sticks of tobacco. A post I wrote about the process includes a couple of photos of tying and loading. Modelling this will require some space between kiln and fascia. Second, at a practical level, the kilns have to help disguise the fact that a few feet to the left of the St. Williams station the world abruptly ends, and a very unrealistic sector plate begins. Tests done by adjusting the position of the kilns shows that the closer they are to the track, the better they do this. The repetitive nature of the kilns – rows of identical structures – also helps, particularly if I play up the ones nearest to the station (with stronger lighting, and with a vignette of tying and loading) to draw one’s eye to the right of the scene. The more I look, the more three seems right: except when broadside one, the three kilns will provide enough of a view-block for normal operations. The broadside view would do brilliantly when playing hide-and-seek with trains, or taking photos of such, in which case one would be close enough to the scene not to be aware of the end of the layout – nor indeed of the grade crossing at St. Williams. Just a few thoughts. Hope they help. You raise an interesting point. With three kilns, there’s more space between the kilns and the grade crossing – a situation which makes it easier to position a camera to photograph or video the St. Williams station. Again, I want to say thank you, everyone, for the excellent feedback. This proved to be a very popular post! Apologies for not responding sooner – it was a busy weekend filled with things that did not involve sitting in front of the computer. But I read each comment closely and will take the ideas under advisement. As a few of you pointed out, I’m working with mock-ups at this point so it’s relatively easy to shuffle them about to try different arrangements. I’ve lived with the five-kiln arrangement for several months now and it hasn’t bothered me. But I’ve currently set up the scene with three kilns and will live with that for a while to see how it works for me. Meantime, I’ll build some kilns – and do other things.